We’re delighted to announce that Daria Rybak was awarded this year’s Carfax college prize. 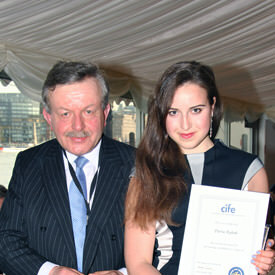 Daria received her prize from CIFE President Lord Lexden in a ceremony held at the House of Lords this March. Daria did remarkably in completing her A levels within a year and a half, while dividing her time and attention between her academic studies in the UK and the pursuit of her true passion, music, at a conservatoire in Switzerland. Undeniably talented, she showed admirable tenacity and good cheer in overcoming the disruption caused by frequent travel back and forth, and in managing to sustain the required levels of effort and practice across all disciplines. Daria deservedly finished with a set of A grades in her A levels and, after auditioning successfully, has taken up the offer of a place to train as a soprano at the Royal College of Music.